Silt is a size category of particles below 1/16 millimeter; that is, below visible range. For this reason QFL cannot easily be determined except with a very good microscope. Generally it is ignored. Closer view of the larger specimen. If you click the images they will take you into closer and closer views. 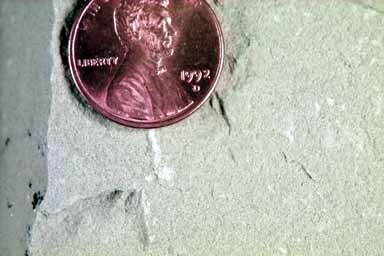 This specimen is toward the upper end of the silt size range. It feels very gritty, like a very fine sandstone, or fine sandpaper, yet under the microscope it is difficult or impossible to distinguish the individual grains.